KORE, the people powering IoT innovations and opportunities, today announced that the company will integrate GTX Corp’s (OTCBB: GTXO), GPS SmartSole® into the Position Logic platform. Additionally, Position Logic will be a distributor of GPS SmartSoles in North America. GPS SmartSole combines a miniaturized GPS device and cellular communicator to send coordinates of loved ones suffering from Alzheimer’s, dementia, autism or any other cognitive memory disorder to their caregivers. GPS SmartSoles look and feel like regular insoles, and allow the wearer to be free from the stigma of visible bracelets, pedants and other traditional tracking devices. GPS SmartSole technology is integrated with a mobile app that allows caregivers to track their loved ones in seconds, lessening their worry and anxiety about wandering. Per the agreement, Position Logic customers will now be able to purchase GPS SmartSoles as a hardware on the Postion Logic platform and then offer it to end-users in the personal tracking space. “Currently there are 100 million people worldwide who are part of this at risk wandering group, including patients with Alzheimer’s, dementia, autism and traumatic brain injury, and that number is expected to reach 277 million by 2050. We’re happy to be working with Position Logic on this integration/distribution agreement and are eager to see the results we know they can drive in North America to help this population,” said Tom Adams, VP Sales Strategy. “Position Logic is constantly seeking new innovative ways to support and deliver greater value to our service providers. With the integration of the SmartSole device in our device library; our service providers can differentiate themselves and offer additional personal monitoring and tracking services. The SmartSole hardware unique form factor presents several advantages especially around people prone to wandering or getting lost,” said Felix Lluberes, executive vice president, advanced applications, KORE. LOS ANGELES, CALIFORNIA –November 1, 2016 – GTX Corp (OTCBB: GTXO), an IoT platform in the personal location GPS wearable and wandering assistive technology business, announced Unforgettable.org has launched an advertising campaign on radio, the SAGA Magazine and social media, designed to help create awareness for those who care for their loved ones suffering from dementia. The campaign provides heart-felt stories together with information, products and services of use to dementia sufferers and their care-givers, and features the GPS SmartSoles that provide a discreet, reliable solution for those who “wander”. Click here to read Paula’s story - https://www.unforgettable.org/blog/paulas-story-mum-was-so-blessed-to-have-dad-there/ or here for the radio commercial on the GPS SmartSoles - https://soundcloud.com/user-486166891/unforgettable-radio-ad-gps-smart-soles. GTX Corp ( OTC PINK : GTXO ), an IoT platform in the personal location GPS wearable and wandering assistive technology business, announced existing Denmark distributor Safecall expanded their operations into Norway and signed an exclusive distribution agreement for both countries. 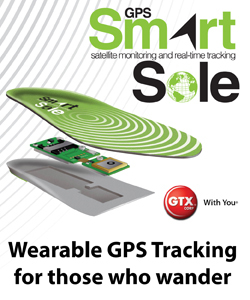 Safecall first launched the GPS SmartSoles in Denmark last October. Due to an increase in product demand and the recent Dementia Plan 2020 announcement by the Norwegian government, it has expanded distribution into Norway and locked up exclusive rights. Safecall has already placed a blanket order of GPS SmartSoles for the remaining of the year for both Denmark and Norway and will be submitting another order to cover the first half of 2017 by end of next month. "Mexico is an important, sizable and strategic market for GTX. As a neighboring country with a total population of over 122 million and a growing middle class representing 47% of total households, it not only represents a market size close to 40% of the U.S. but also a strategic entre into Latin America," stated Andrew Duncan, director of business development for GTX Corp. "We are pleased to add C&R to our growing list of international partners and look forward to meeting with Claudio this week in our office to discuss our product rollout and strategic initiatives for the rest of the year." With an estimated 1 million Americans currently living in Mexico, the country is also seeing a growing number of U.S. retirees, attracted by better weather, similar to Florida, Arizona and California, which benefit from a more relaxed lifestyle, affordable quality health care and an overall much lower cost of housing and living. Claudio Quinzanos, C&R Care Solutions CEO, stated, "We are excited to be offering the GPS SmartSole as well as other smart and useful GPS solutions from GTX Corp, to caregivers in the senior assistance market for those suffering from Alzheimer's and dementia, as well as the security market to help prevent criminal acts such as kidnappings. We are convinced that this discreet, accurate, wearable tracking technology is the best solution to fulfill our customers' needs and makes for a better and safer society in Mexico and all over the world." SecuritySolutionsWatch.com: Patrick, thank you for joining us again today. Please update us on the latest developments at GTX and in the GPS SmartSole market as a whole. GTX Corp Expands Distribution in the U.K.
SecuritySolutionsWatch.com: Thank you for joining us today, Patrick. Before discussing GTX Smart Wearable Technology in greater detail, please tell us about your background. Patrick Bertagna: I have spent the past 35 plus years building consumer product and technology companies and GTX is the perfect mix of both, being it’s a “wearable tech” company. We were certainly one of the pioneers in the wearable tech industry and my back ground of design, manufacturing and sales of consumer products combined with my tech and intellectual property background, having founded 2 software companies, enabled me to bring those skill sets together under one roof at GTX. Prior to GTX I had founded 6 other companies. SecuritySolutionsWatch.com: One will read on GTXcorp.com that, GTX Corp (GTXO) is a pioneer in Smart, Mobile and Wearable GPS, cellular and BLE tracking and recovery technology. Empowering the global community and keeping you connected to who and what matters most with GPS, cellular, BLE tracking and recovery location based services. Headquartered in Los Angeles, California, with distributors in over 14 countries, GTX is known for its game-changing and award-winning patented GPS Smart Shoe, blockbuster Smartphone GPS Tracking App, and innovative GPS and BLE SmartSole. Please give us an overview of the SmartSole and your other GPS solutions. Patrick Bertagna: The SmartSole is our flagship product, think Dr. Scholl’s meets LoJack. We make a miniaturized GPS and Cellular module and embed it inside an orthotic insole. The application is for people who have a memory disorder and have a tendency to wander, anyone with Alzheimer’s, dementia, autism, traumatic brain injury, etc. Currently there are over 100 million people worldwide who are afflicted with one of these debilitating aliments. Being that our module is small and robust we also imbed it inside other form factors and we are starting to look at OEM deals. And then we have our tracking App, which basically turns a smartphone into a tracking device, the application there is for mobile work force, sales people, delivery people, service business like electricians and plumbers, police officers, just about anyone that works in the field and benefits their superiors to know where they are at any time at the touch of a button. SecuritySolutionsWatch.com: Patrick, I think is fair to say that every one of us knows of a situation in our own families where someone, young or old, or with a certain illness, is at a higher risk for potentially wandering off. The GTX solutions are indeed compelling in providing oversight, protection, security and peace of mind. Are there any particular heart-warming success stories you can share with us? SecuritySolutionsWatch.com: What is your perspective Patrick regarding the size of this market? Patrick Bertagna: The wandering recovery market is very big- 100 million people today and expected to grow to 277 million by 2015. So even 1% or 2% of that market is an absolute big win for us. And then some of the other market segments are very large as well, it is estimated there are close to 30 million small and medium businesses (SMB’s) in the U.S. and perhaps close to 200 million worldwide, which makes for a very sizeable market. SecuritySolutionsWatch.com: It’s clear why several healthcare groups have joined GTX in strategic cooperation. Care to tell us about these strategic relationships. Patrick Bertagna: Our alliances are certainly growing but already only after 1 year from launching our SmartSoles we have vendor numbers or reimbursement codes in 5 states, we have recently begun working with the Department of Health and Human Services, have done pilots with The Health Ministry in the UK and Canada, we are in conversation with several large insurance providers. We also work closely with non-profits like the Alzheimer’s association and some autistic foundations and the list is growing. Please see some of our reviews here. SecuritySolutionsWatch.com: We read with great interest regarding recent patent protection for GTX. Care to elaborate? Patrick Bertagna: That’s the crown jewel of the Company. We have an extensive IP portfolio with over 80 patents. It is becoming more apparent that these patents are very significant and valuable, especially with a priority filing dates going back to 2002 when many of the location based technologies had not yet been fully developed, and certainly not with the functionality pertinent to wearable technology today. SecuritySolutionsWatch.com : Congratulations of the recent launch in Latin America. Please tell us more about your distribution channels and what might be on the horizon? Patrick Bertagna: Distribution is very important to us and we are extremely focused on building those channels. We currently have over a dozen distributors across the globe and in conversation on any given day with another dozen. Latin America is our next big push, we have pilots testing in about 4 countries in LATAM and expect to announce some new partners in the coming months. Europe is also very strong for us and we have most of North Western Europe covered and we are now starting conversations with Southern countries like Spain and Greece. We are also in conversations and testing in the Middle East, India, and a few countries in Asia. Our goal is to have distribution in over 20 countries and sell in over 40 counties by the end of the year. SecuritySolutionsWatch.com: Kudos, also, on the being a winner in the 2015 New Product & Technology Awards. This is indeed, quite impressive. Any other acknowledgements you’d like to mention? Patrick Bertagna: Yes besides the 2015 New Product and Technology award, we also came in second place at the CTIA Wearables, Health and Fitness awards, with Microsoft in first and Samsung in third, so not a bad place to be in-between those two tech giants. We were also listed in AARP top 10 New Technology, we were a finalist in the Connect World awards, and recently featured in Entrepreneur.com . Overall we have been greatly honored by our peers in the industry and we are truly humbled and appreciative. SecuritySolutionsWatch.com: What resources are available for the GTX community on your site? Where can you place an order? SecuritySolutionsWatch.com: As a relatively small publicly-held company today, albeit with a huge market opportunity and growth potential, what would you like the investment community to know about the stock (OTC GTXO) ? Patrick Bertagna: We don’t just make tech gizmos, we sell solutions that have purpose and we are creating value by building a Brand, keeping it Relevant and protecting it with Intellectual Property. GTX is a great Main Street story- our solutions change and save lives, that’s pretty compelling. And on the Wall Street side, we are one of the few pure plays in the wearable technology space – with potential exponential growth. We have one of the best solutions in the market, protected with a lot of IP and best of all our business model is a recurring, high margin subscription model. And management believes that the Company is currently undervalued. SecuritySolutionsWatch.com: Thanks again Patrick for joining us today...are there any other subjects you would like to discuss? Patrick Bertagna: I am truly pleased to share with everyone, that SmartSoles has just been featured on the Galileo show on Pro Sieben Sat 1, a prominent well respected show in Germany on cable TV Channel. Here is the link: https://www.youtube.com/watch?v=qGrCUWyL8Fc. We could probably talk for another hour with all the different opportunities we have in front of us right now, but in the interest of time, I’d like to finish up by saying we are very excited about some of the initiatives we are working on - with police departments across the country, to adding to our list of vendor numbers for reimbursement codes and our latest patent grants in the “286” family. Thank you, this was fun and I look forward to the next interview.